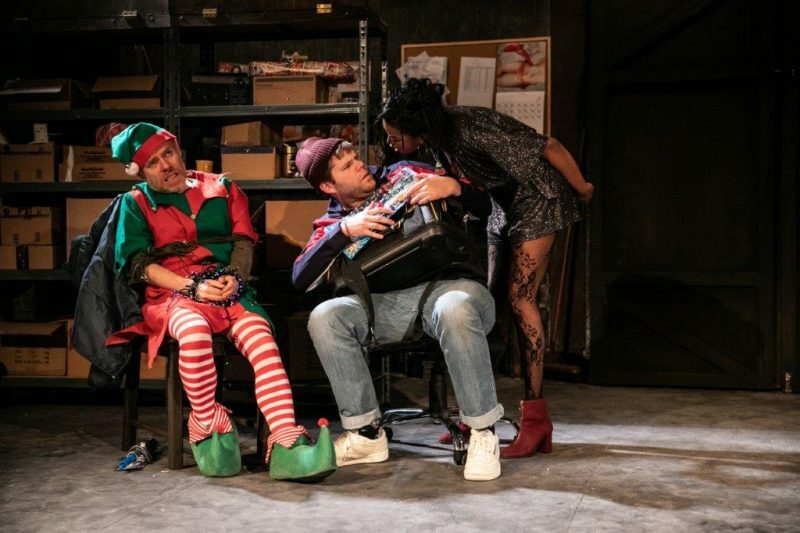 A darkly-twisted black comedy about the holiest holiday of the year, – this is how I’d describe The Night Before Christmas, staged at the Southwark Playhouse this December. Head there if you are looking for a funny and unconventional show this festive season. 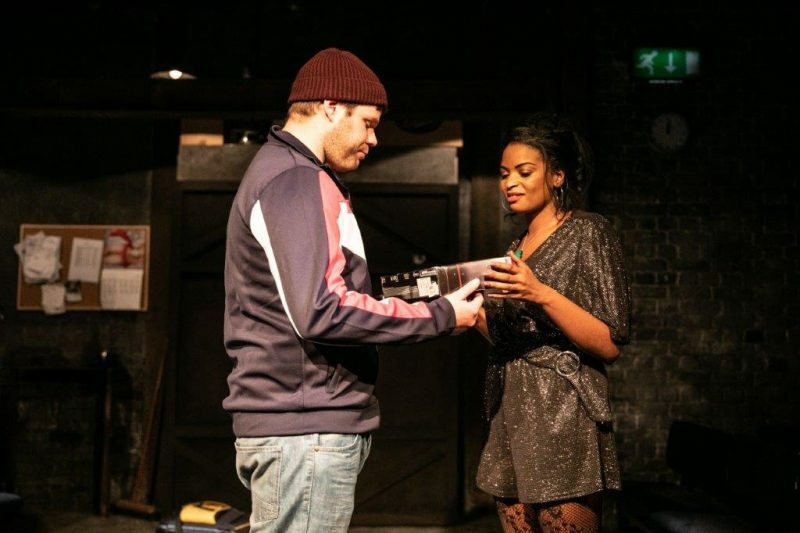 This production is all about social misfits; Gary, a divorcee with an illegal business, Simon – a single man in his late 30’s and still living with his mum, and Cherry, a prostitute. 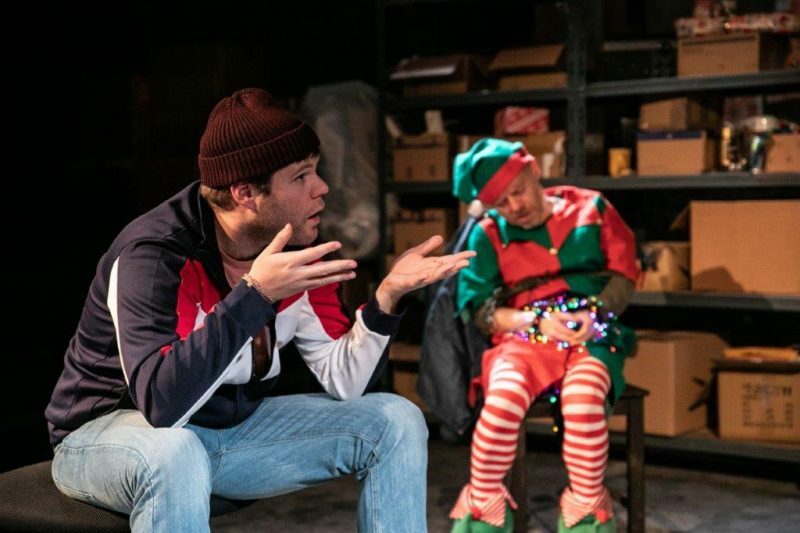 The group have to deal with an unusual situation on Christmas Eve. 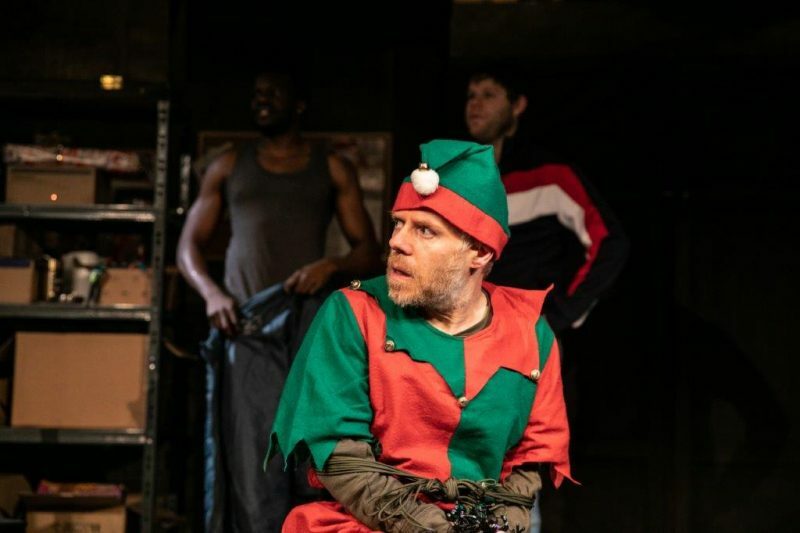 A rather funnily dressed person of short stature has broken into Gary’s warehouse, and is claiming to be Santa’s little helper, more commonly known as an elf. Working for Santa, the elf knows all about Christmas, and has to share this knowledge with our group of skeptical and cynical adults, who’ve imprisoned him, and are struggling to believe what they are being told. 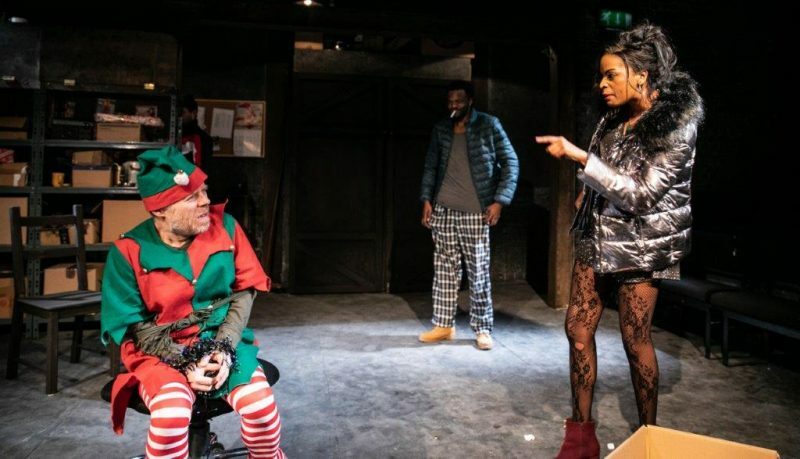 With black jokes and gags, the play tries to answer the questions, which each of us has tried to solve over the years: When did Christmas stop feeling magical? What makes this day of the year so special? And how do you find the real joy in this commercialised holiday? Following some greatly written conversations and dialogue between the characters, we not only discover more about them, but start to feel a great deal of empathy towards them. The Night Before Christmas helps us to realise how similar we all can be when the matter is as general and important as universal joy, happiness, and belief. The set and costumes are kept minimal, but it feels sufficient for the action happening on stage. The cast give strong performances, and the intimate staging helps the audience to feel immersed deeper into the performance. At just an hour in running time the pace is quick, but I could happily watch a longer version, and never get bored. All that we love about Christmas is spiced up with all that we hate about this holiday, and exaggerations of the darkest sides of the festive season are utilised brilliantly to push our thinking in the right and positive direction. We go on a journey together with these incredulous characters, and we get to see all the good, and annoying, things that Christmas so often brings to us. It takes an almost-killed elf for the characters of The Night Before Christmas to make the right choices, throw away all the skepticism, and wish for a Christmas miracle. What will it take for you? 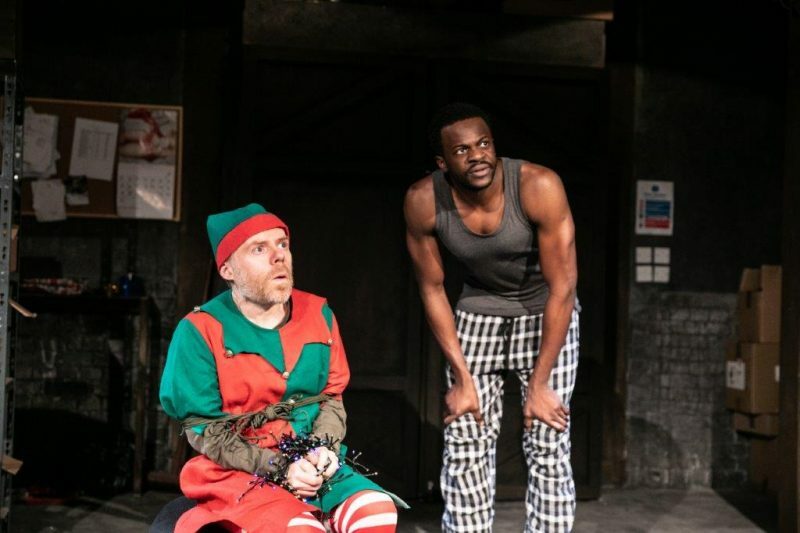 Find out at the Southwark Playhouse until 29th December 2018.